Are you into absinthe? I’m definitely not averse to it as a little-goes-a-very-long-way ingredient in a numerous drinks, but I can’t say that I’m a fan of it in it’s classic mode of preparation. It’s not just it’s strength and bitterness, it’s the fact that I’m not even a fan of licorice candy, let alone industrial-strength anise and fennel. On the other hand, if there’s one ingredient I’ve found in my alcoholic wanderings that can transform a potentially repulsive drink into a taste treat, it’s a raw egg white, properly emulsified. This week’s drink, which comes I know not from where, puts that theory to the test in a big, big way. Let’s get this wormword and poultry-product party started. Combine all the ingredients in a cocktail shaker. To emulsify the egg white, shake vigorously without ice. Then, add ice, shake vigorously again, and strain into a wine glass. Toast the legalization of absinthe back in the mid-2000s when people started to figure out that the stuff is no more (or less) dangerous than other types of booze. Prohibition never works. Well, I guess this is another vote from me for the miraculous properties of raw eggs in cocktails as, on balance, I really like this drink. In fact, I like this drink so much that, even though I’d have a hard time finding a difference between good absinthe and bad absinthe, I’d almost spend the $70 or more it takes to buy some of the putative good stuff just to try it in a Round Robin. Why? Well, just as an Old Fashioned humanizes even a very strong bourbon or rye, the Round Robin actually makes the bitter licorice on steroids flavor of absinthe not only tolerable but fascinating. While I only have one brand of absinthe on hand and it’s not supposed to be that good — I gather than aficionados of the wormwood liquor find Absinthe Ordinaire to be appropriately named at a mere 92 proof — I did try different brandies out. Killing my bottle of St. Remy worked just fine but a Ile de Ré Fine Island Cognac worked even better. However, the one big change I made from my usual habit was was using a pasteurized brand of egg white I picked up at my local Trader Joe’s (3 tablespoons of the stuff is said to approximate one egg white). While the the seemingly low viscosity of the stuff looked suspect, the fact of the matter is that it worked just as well as the stuff you get directly from the chicken…and I know my friend from the local health department would agree that salmonella is about the last thing I need right now. I’m usually not one to worry about such stuff, but if you’d been through as many perfect storms I’ve been through over the last six months, you might be a bit extra cautious yourself. Coming up next: An adventure with pasteurized whole eggs and a coffee drink with zero caffeine and no decaffeinated coffee, either. Liquor is a staple in the hip hop world. Flashy cars, hot girls, stacks of money, and of course … the partying. Rappers like Eminem, 50 Cent, Ice Cube, Notorious B.I.G., Tupac, and many others get behind their brands. There is no shortage of the hard stuff whenever you catch one of their videos and if you happen to catch them in a club you’ll quickly see them poppin’ bottles at a table. This love for the booze has even gone as far as to catch the attention of researchers which found that out of 700 top billboard hits almost 23% of them had some mention of alcohol. The question becomes … which ones and what kind of drinks can you make with ‘em? Whiskey and bourbon are two fine choices you’ll often hear mentioned in videos. These are the drinks of gangsters – to whom many rappers try to replicate at least in image. 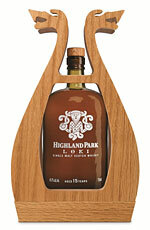 The aged drink shows sophistication and says that you’re not just there to chug down grain alcohol. 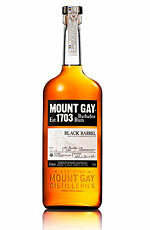 Of these brands, the Island of Kentucky has been putting out some of the best. At around 86 proof (43% alcohol) you can expect to get turned up on one of these bottles. Chill an old-fashioned glass. In a separate mixing glass, muddle the sugar and Peychaud bitters together. Add the whiskey and ice to the bitters mixture and stir. Rinse the chilled glass with Ricard Pastis by pouring a small amount into the glass, swirling it around and discarding the liquid. Strain the whiskey mixture from the mixing glass into the old fashioned glass. Garnish with a lemon twist. The tequila that doesn’t taste like the devil and a favorite among rappers. Patron is going to set you back a bit of money depending on the size of the bottle (expect to pay about $45 and up for a decent size) but it’s worth it once you taste the difference. You ain’t going bottom-shelf on this one. This legendary alcohol has been a favorite among rappers for decades. Tequila is usually one of those drinks that completely floors you but everyone has seemed to take a liking to Patron (probably because it doesn’t give you the rot gut, massive hangover the next day, as easily). Fill cocktail glass with ice then add the Patron Silver Tequila, Creme de Cassis, and fresh Lime Juice. Top off with Ginger Ale. Garnish with a lime wedge. Now there’s a drink for the ages. Hennessy go real popular once the hip hop crowd found it with big mentions by the likes of Tupac, Biggie, Drake, Dr. Dre, Wu-Tang, and a bunch of others. The reason why you’ve probably heard of the name is most likely because of a hip hop song. Fill the hurricane glass with ice. Pour the Hennessy, Red Alize, and Yellow Alize. Splash in some Cranberry Juice and top it off with soda. For garnish you can add a slice of pineapple and cherries. If you’re thinking about stocking up one some booze for your next party or if you just want to have some around the house than these three choices are great for building up that stock. You don’t have to party as hard as the hip hop heads but you can certainly drink like ‘em. Try out some of the mixes, too. Remember: you don’t always have to drink it straight from the bottle. What are you willing to give up for a cocktail? If you live in Los Angeles, the answer for the casual fancier of serious mixed beverages might be as high as $17.00 in some joints. If you’re one of the people who actually makes his living trying to make really good cocktails, however, the price might be a little higher still. As I’m learning from an upcoming film I’m probably embargoed from discussing in any detail, the documentary “Hey Bartender,” the business of dispensing booze can take from a person’s life, but it can also give. However, the price I’m thinking about right now has mostly to do with the garnish — yes, the garnish — of today’s drink. The Ritz Cocktail was created by a cocktail legend I’m not sure I’ve even mentioned here before, and that’s largely due to the fact that I’m still a relative newbie to serious boozing. Although he’s not quite a household name — even his Wikipedia page is a still a stub — Dale DeGroff is credited by lots of folks as spearheading the revival of the lost art of the American cocktail. This started back in the 1980s, when he was at the Rainbow Rock at Manhattan’s 30 Rock, I was still in school, and most of the oldest of you all were lucky to be past the zygote stage….and DeGroff is still a relatively young man for a living legend. Well, his Wiki doesn’t give his age, so it’s hard to be sure. Today’s drink is contained in DeGroff’s epochal 2002 tome, The Craft of the Cocktail. It’s named in honor of the several legendary bars of the famed Ritz hotel chain founded by César Ritz. Much as Mr. DeGroff has been dubbed “King Cocktail,” Mr. Ritz was dubbed “king of hoteliers, and hotelier to kings.” So far as I know, however, he had nothing to do with the cracker. 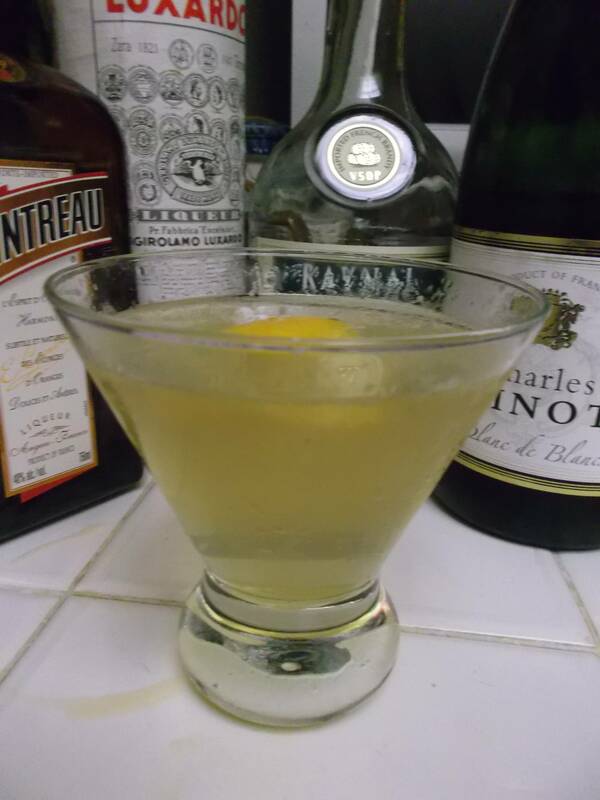 As promised when I took on the Corpse Reviver #2 last June, I’ve finally gotten around to the less known apparent original drink to bear the name. While my first attempts at a Corpse Reviver made it easy to see why it has been eclipsed by the gin and Lillet Blanc based sequel, with the right ingredients it really can wake up your taste buds and temporarily enliven your soul. We’ll simply ignore the fact that I happen to be writing most of this post on Easter Sunday of 2013. In any case, the real reason for the name is that this drink is supposedly a hangover cure — though it’s not so much hair of the dog as a good chunk of the canine. Nevertheless, let us begin the revival. 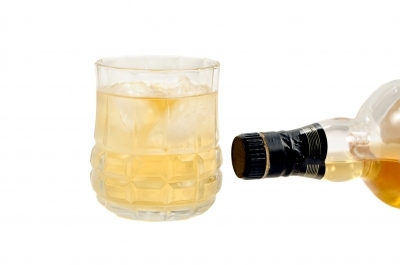 Combine the ingredients in a cocktail shaker or mixing glass. Although I’m generally in favor of shaking over stirring, I say you should stir your Corpse Reviver. Little ice crystals are the last thing you want in this drink. Nevertheless, stir vigorously and strain into a chilled cocktail glass and drink — to life, I suppose. 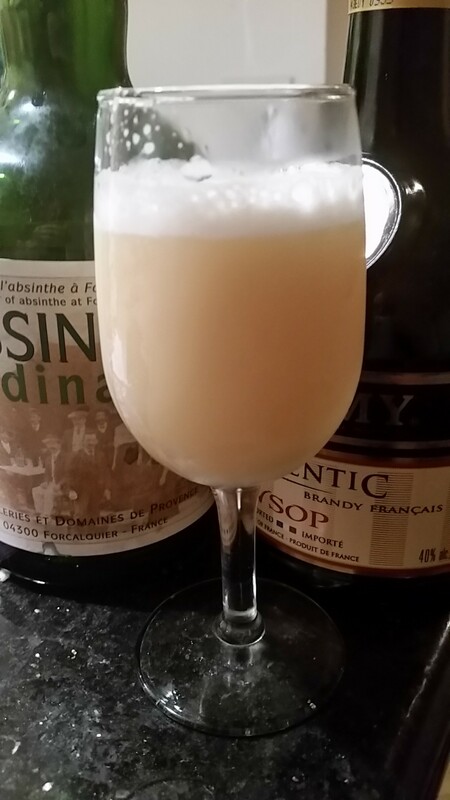 I messed around with the ingredients a lot on this one, but I used only one type of apple brandy. Calvados seems to be the classic choice of apple brandy for this drink and the Calvados Coquerel I’m using is expensive enough for half a fifth that I wasn’t in the mood to try out any competitors or more downhome variations. (Some recipes call for applejack.) I had just enough left over Ile de Ré Fine Island Cognac on hand to make one very sophisticated, yet perhaps too understated, version of the drink using my standard Noilly Pratt sweet vermouth. I moved on to my personal favorite value brandy, Reynal, which isn’t made with genuine Cognac grapes but which is produced by a company with offices in the French town of Cognac. 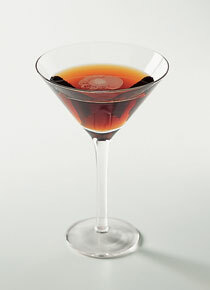 Using the Noilly Pratt vermouth along with the Calvados yielded an acceptable, but very unspectacular drink. However, I still had some Carpano Antica on hand that had been thrown my way by mysterious benefactors — improperly stored due to a massive snafu on my part but still acceptable for use. That yielded a lovely result, with the bittersweet, chocolate-like character of the high end vermouth providing a very nice bottom against the lighter, boozier notes of the brandies. I was less pleased — but still pleased — when I tried the exact same drink with another favorite, Punt e Mes, which is in many respects very similar to Carpano but a bit sharper edged. Try it with one of those. Now, we come to the point in these weekly missives where I usually like to make some kind of a quip or draw some larger conclusion about the drink. With a name like the Corpse Reviver, I suppose you’d expect that. The problem is that I really have no “larger” thoughts right now other than the fact that I certainly do not recommend this drink as a breakfast beverage. Maybe the gods of cinema can give me a hand.